While it's still early January, I've started to watch for Rhododendrons in bloom. Here in the Pacific Northwest, there aren't many yet, but I've seen a few brave trusses of what I think are 'Christmas Cheer' and 'Nobleanum'. Since the plants I see belong to someone else, I have to guess at the varieties. The pale pink flowers of 'Christmas Cheer' look so delicate, but this is a tough hybrid. With mild winter temperatures, the flowers last for weeks although one hard frost will damage them. On the plant that I think is 'Nobleanum', the flowers are rounded balls of deep rose pink. I can't get close enough to the plant to see if there's a flush of white in the flower centers, but this would be typical of the variety. 'Bo Peep', another very early hybrid I see, is also just about to bloom. This small yellow flowered plant won't win prizes for showiness, but how can you not like anything that is in flower now. 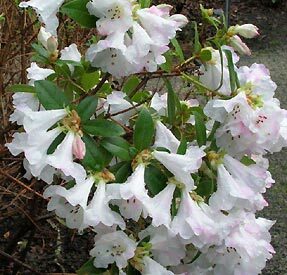 In my own garden, 'Seta' is the earliest of my rhododendrons to bloom. I just love this hybrid. The flowers are tubular: light pink inside with dark pink backs. 'Seta' is loaded with flowers every year, and blooms reliably for me by mid-March. I have one 'Seta' in a large container that I move onto the deck when it's in bloom and I like this variety so much that this past fall, I planted another one in the garden. 'Snow Lady' is another of my early favorites, and it also blooms for me in mid-March. In addition to lovely white flowers, the leaves are hairy, adding another interesting dimension to the plant. The leaves are particularly pretty when there's a bit of dew on them. I grow 'Snow Lady' in a container, and it looks great when placed next to 'Seta'. Both 'Seta' and 'Snow Lady' tend to get leggy, but who cares! They're great harbingers of spring. I could pinch them back a bit after blooming, but I like their open habit. If you like the look of these varieties, another variety to look for is 'Cilpinense' (photo right). Another of my favorite early bloomers is R. mucronulatum 'Cornell Pink'. I like the pale pink flower color, but many people in our area prefer the more intense fuchsia-pink flower of 'Crater's Edge'. Some of the species that bloom early for us in our area are super plants. R. dauricum, R. moupinense, and R. strigillosum all bloom in late winter or very early spring. R. dauricum covers itself in small flowers of either intense fuchsia-purple/pink or pure white flowers. 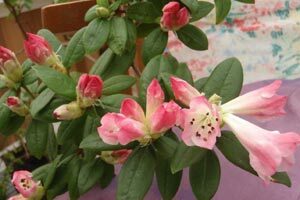 R. moupinense is a hardy pink flowering rhodie. The species has white flowers with small, red blotches. If you like red, then R. strigillosum is for you. This is a stunning early bloomer. In addition to the lovely flowers, R. strigillosum has hairy bristles along young stems, which are very pretty, especially when backlit. To give yourself the longest possible chance for blooms to persist, you need to locate early blooming plants in an area where they receive some overhead protection from frost. My neighbors actually cover their 'Christmas Cheer' at night with a blanket if hard frost is expected during blooming time. By doing this, most years they are able to keep the plant in bloom until mid to late March.